This recipe is a perfect introduction to working with yeast. 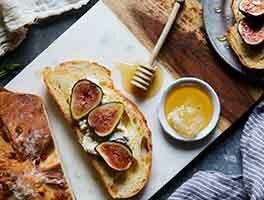 It goes together in a snap — no kneading necessary — and yields a flavorful, golden brown loaf with a pretty yellow interior. Its slightly chewy texture works well for sandwiches and toast. *The shredded cheese will disappear into the crumb, while the diced cheese will create little pockets of melted cheese. We used half shredded, half diced. If using raw onion and garlic, sauté them until they're golden brown, then set them aside to cool. You can skip this step if using the dried onions and jarred garlic. Lightly grease a 2-quart round casserole dish or 9" x 5" loaf pan. In a large bowl, whisk together the flour, Pizza Dough Flavor, yeast, and salt. Stir in the onions, garlic, and cheese. In a separate bowl, whisk together the eggs and milk. Add the liquid to the flour mixture and beat well for 2 to 3 minutes (the batter will be thick). Scoop the batter into the prepared pan. Cover the pan and allow the dough to rise for about 1 1/2 to 2 hours, until nearly to the top of the pan. Towards the end of the rising time, preheat the oven to 400°F. Bake the bread for 40 to 50 minutes, until golden brown and a digital thermometer inserted in the center reads at least 190°F. This loaf browns quickly; check it after the first 20 minutes, and tent it with foil as soon as it begins to brown. 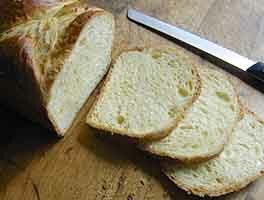 Remove the bread from the oven, and serve warm, or at room temperature. Store at room temperature, well-wrapped, for several days; freeze for longer storage. I made this bread today and it was so delicious. I didn't use fresh sauteed onions or garlic, instead I used 2 teaspoon garlic powder and 1 teaspoon onion powder. The bread rose beautifully and is delicious toasted with a slithering of butter. 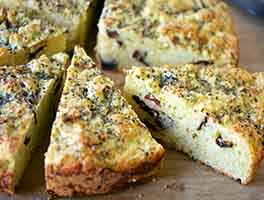 I enjoy asiago cheese bread from Panera and thought it would be good in this recipe. I used 4 oz shredded and 4 oz diced. 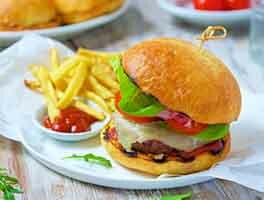 The diced cheese remained as little clumps throughout, giving each slice a weird look. I baked it until a thermometer read 190 but the loaf collapsed a bit while cooling. I take the blame for using the wrong cheese (maybe that's why it collapsed?) but I'm giving this recipe 3 stars because it had waaay too much garlic (I used 3 large cloves). Could it be because I grated the cloves with a microplane? 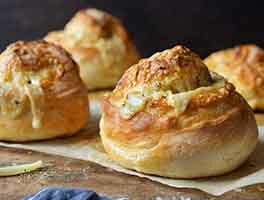 The garlic completely overwhelmed any cheesy flavor or potentially cheesy aroma of the bread. Anyway, I'll probably try again someday using one of the recommended cheeses and only 1 or 2 cloves of garlic. Delicious! My husband loved it. Used a Tillamoook sharp cheddar and a KAF loaf pan. No problem with the pan releasing the loaf as soon as it came out of the oven. Amazing! Go make this now, it's that good. I wish I made two loaves as there is nothing left. It takes a long time for the rise, but totally worth the effort. The crumb is soft, moist, and perfect air pockets. My changes: no pizza flavor so I used 2 tsp of Penzys cheese sprinkle, used 1/4 c of KAF milk powder to make 1 c of milk + 1/4 c of milk I had left, 2 c shredded moz. Oven was in use for the entire rise at 325 (slow roasting cabbage) so rise was not quite 1.5 hr to get to the top. Baked for 35 min in pan, last 8 out of pan. This is going in regular rotation! As with maryasheville, I used sharp cheddar and also added a 6 oz. package of reduced fat Hormel bacon bits. Really nice toasted, with strawberry preserves. Plan on using it for BLT's, though I guess they would only be LT's since the bacon is baked in. 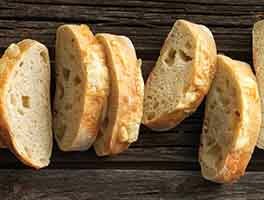 Delicious, savory, easy bread. What a treat. Definitely better warm. Great the next day as well. No trouble popping out of the pan. Casey Nicolello from San Pedro, Ca.